The day dawned clear, crisp and cold. 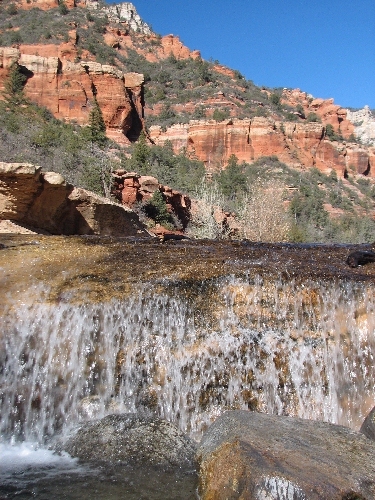 The first stop was Slide Rock State Park in Oak Creek Canyon. 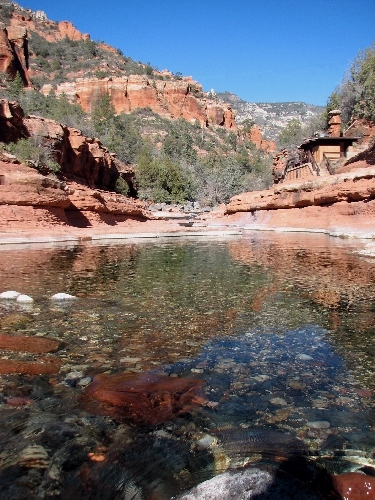 A great natural playground of water, red rocks, deep pools, and smooth red rocks. Another view of Oak Creek. Fifteen miles upstream is the top of the canyon wall. Oak Creek is at the bottom of the canyon. 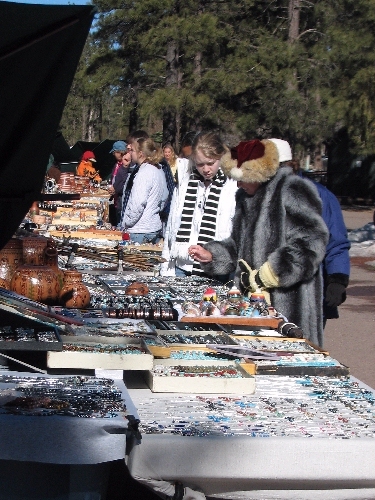 At a Coconino Forest Overlook there were artisans selling their wares. In the middle of the picture, Emma is trying to decide what to buy. 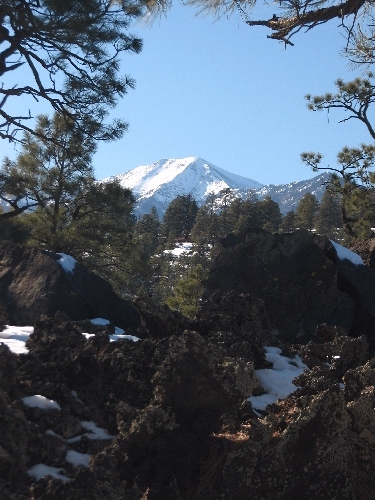 North of Flagstaff is Sunset Crater National Monument. 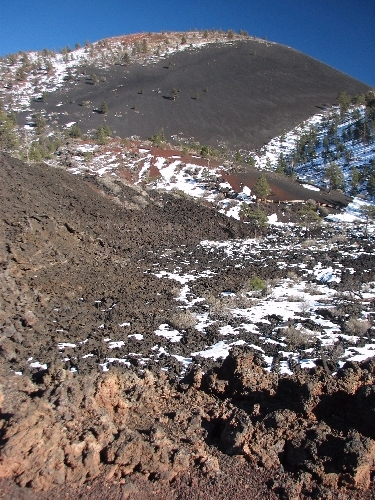 This is the cinder cone of a volcanic eruption “only” 1000 years ago. It’s a little like Hawaii in the winter! A few pioneer trees have started to grow in the ash. Emma decides to climb up for a better view! The other direction from Sunset Crater is this view of the San Francisco Peaks, the highest point in Arizona at 12,000+ feet just north of Flagstaff. 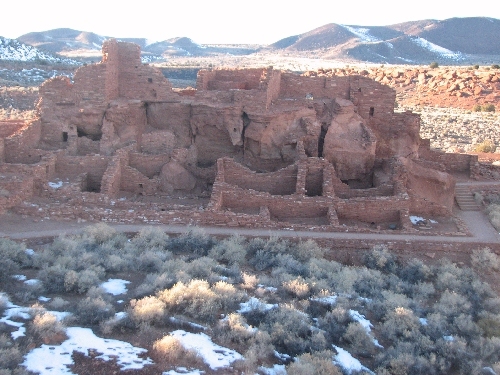 These are the biggest ruins at Wupatki National Monument. 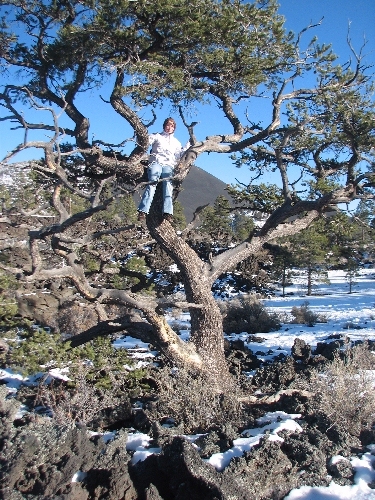 It was the biggest structure for about 50 miles around at the time of the eruptions at Sunset Crater. 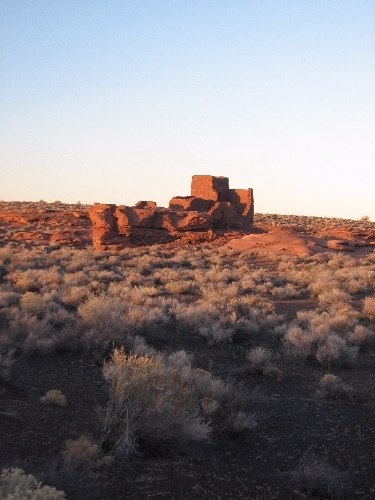 This is another ruin near the Wupatki ruin, the Wukoki Pueblo. These were occupied in the 1100s – about the same time as the Crusades in Europe, to give some Western Civilization context. We had a hard time thinking about living in these dry, windy treeless areas as a home camp. 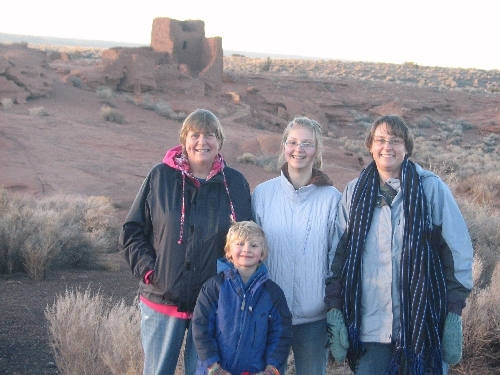 A shot of some happy travelers at the end of a good, long, day! Today was a travel day – Des Moines to Phoenix via Chicago. 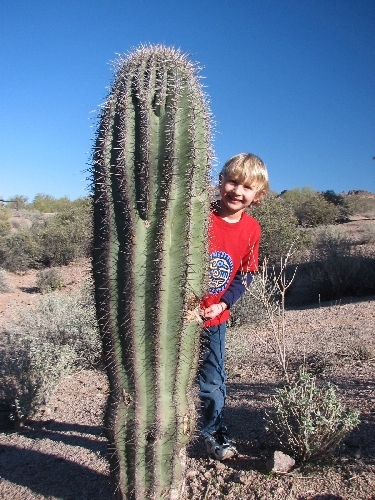 Since most of our time will be spent in northern Arizona and when the kids think of the Arizona desert, they think of the Sonoran Desert, land of giant Sugaro cactus. So we ventured immediately to Lost Dutchman State Park, just east of Phoenix to view the Sonoran Desert. I think this is a small Sugaro cactus Marty is hiding behind. The kid is so excited for this trip! 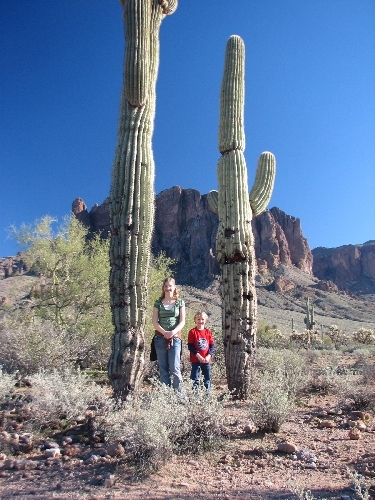 Marty and Emma pose by some mature Sugaro cactus in front of the Superstition Mountains. 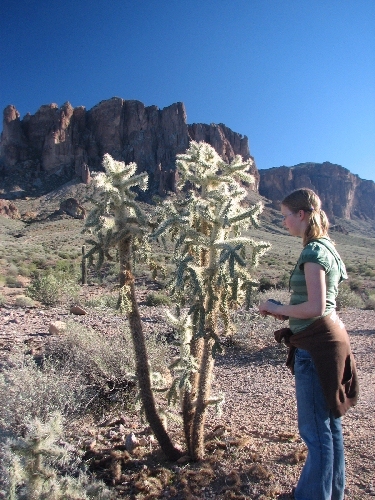 Emma examines a plant very unlike any near to her home – a jumping cholla – looking very fuzzy this time of year. After a quick late lunch and grocery shopping stop, we headed to our lodging in Sedona. The band raised money for a year for their trip. 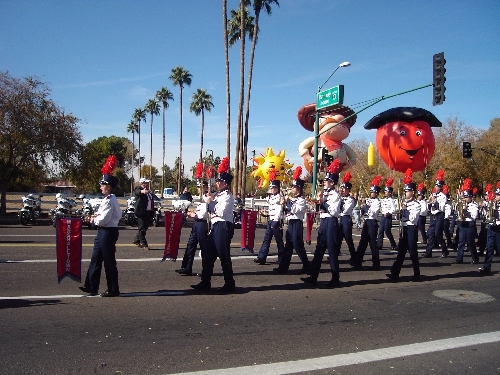 Here is the Bobcat Marching Band in the Fiesta Bowl Parade in Phoenix, AZ. Here is the Bobcat Marching Band on the field. 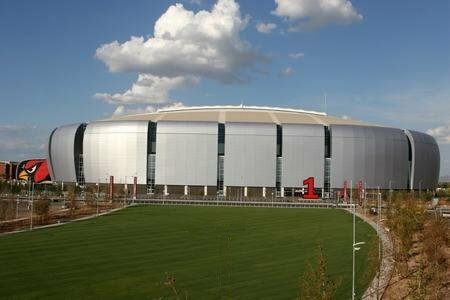 In contrast to most events – the more expensive tickets were furthest away from the field. 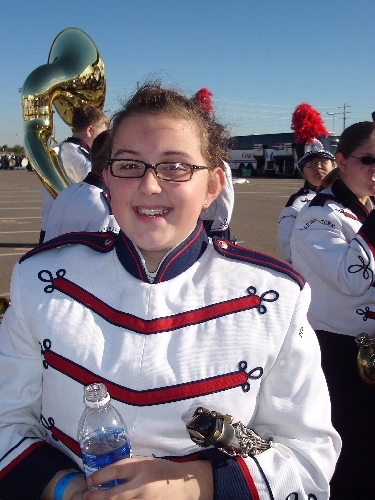 Here’s Claire getting ready just before the field show. A close-up shot of Claire in her uniform. All pictures courtesy of gj. 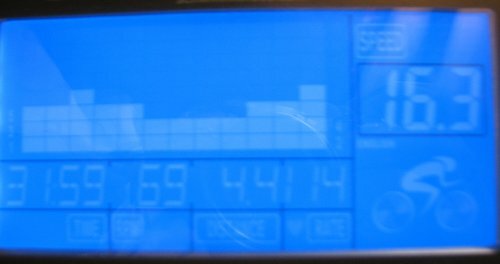 December 28, 2007 – Claire is Here! 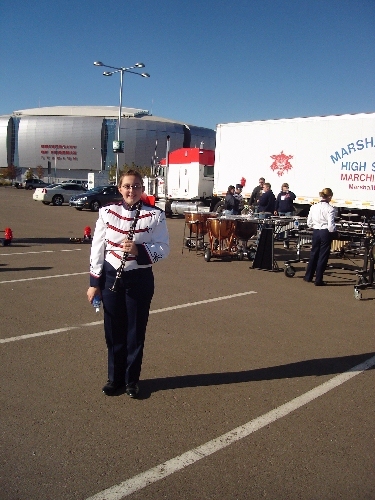 Claire’s band is Marching in the Fiesta Bowl National Band Championships in Glendale AZ. She’s somewhere in here. GJ is there watching her and when she gets back, we’ll post some better pictures. 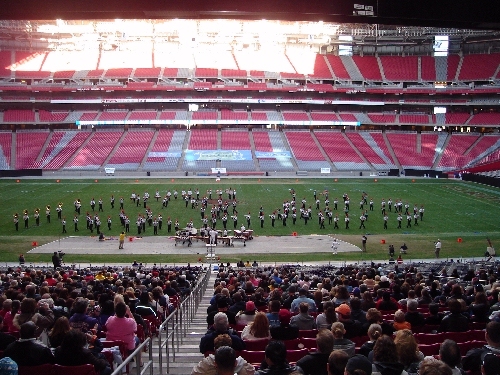 We were able to watch the performance on the internet last night – it was fun to see them on a big field and venue. Today is the parade, then they relax for some sightseeing. one year ago…Fencing Me In. This winter is especially hard on birds and animals that forage of the ground. The thick mantle of ice make the ground and seeds and such inaccessible. We put up a bird feeder for the first time in years (the cats used to catch the birds, so the stopped). But so far this year, the cats have not bothered the birds. Either they have grown too old, or found better sport elsewhere. 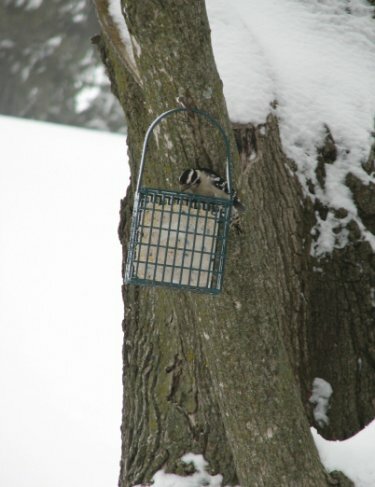 This is a female Downy Woodpecker at the suet feeder. 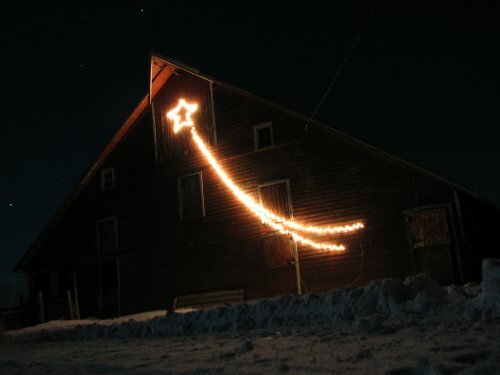 Season’s Greetings from the barn at high hopes gardens! 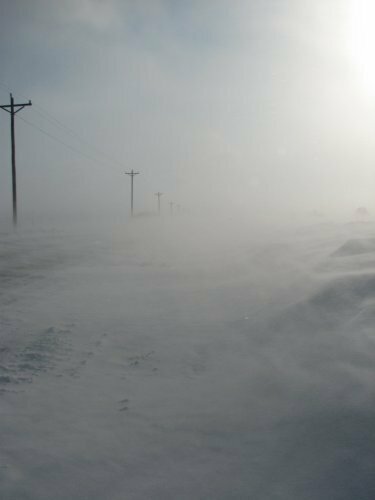 As expected, the snow and wind came – up to 40 mph gusts today. We tried to go to church this morning, but only made it a few hundred feet down the road before burying the van in a drift. Thank goodness for the tractor to come to the rescue! It was good to get gj out of here yesterday. When the wind starts blowing like this, there’s not much to do except sit at home and wait until things get better. There’s been more tractors and tow trucks by the road today than cars. 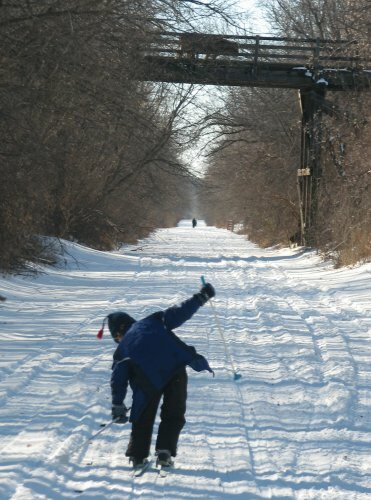 Most everyone who tried to get by got stuck. On this day we usually have about 100 people descend upon our house for a giant bonfire and potluck. 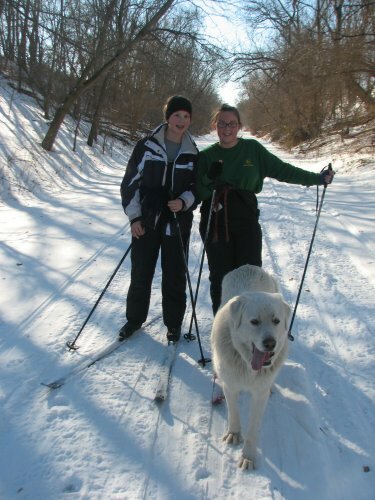 Due to the extreme winds and snow, we postponed it until tomorrow. We even brought gj to the airport a day early since we weren’t sure we’d be able to get out tomorrow. 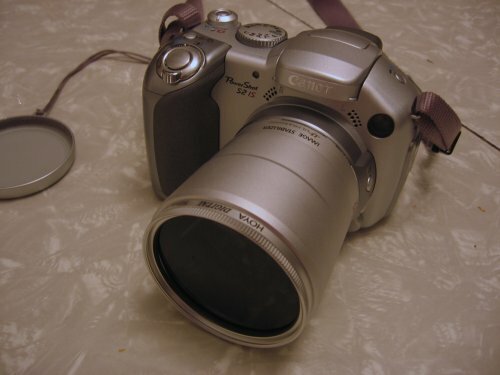 December 21, 2007 – New (to me) Camera! I used to have a nice SLR camera (Canon AE-1) that I bartered for a bunch of Christmas trees back in college. 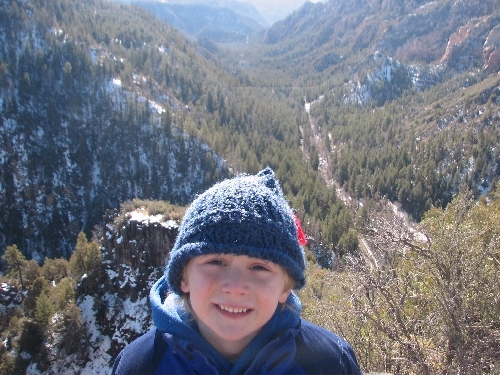 I loved that camera – while climbing a mountain in Utah, it became separated from me and bounced down a snowfield in its case a couple of thousand feet and lived to tell about it. I started with point and shoot digitals for the last few years, and was waiting to save up for a new digital SLR, but could never quite justify the cost with other expenses. My current point and shoot was starting to be on its last legs, so I bought this Canon S2 on Ebay for about 1/4 of the list price. Since the S3’s are out, all the folks that need the latest and greatest jettison their old stuff – but it is in perfect shape and I appreciate that on this model I can attach filters, wide and telephoto lenses and have manual control if I so wish. 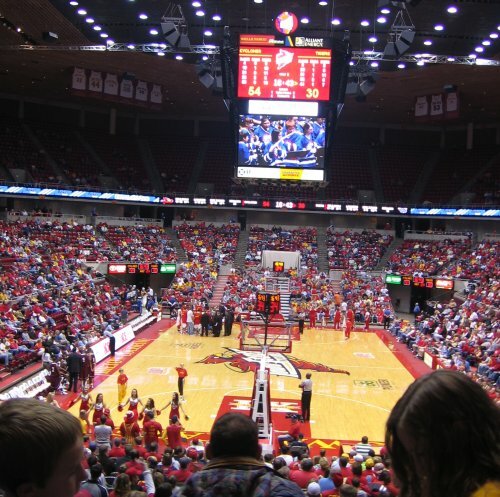 Today Claire’s band had a “day off” of school and they rented the indoor football practice facility at Iowa State and practiced their Fiesta Bowl program all day, then played at an Iowa State basketball game where they filled in for the ISU pep band that was off on winter break and not on campus. The real band is down to the right and on the video screen Claire is behind the red-head (as if you can see it! 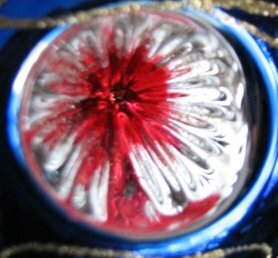 )Â But many of you have much better imaginations and eyesight than I do and will be able to make her out. I sure appreciate the director, Mr. Lee. They aren’t leaving until after Christmas, but their luggage and most of the instruments left for Phoenix in a truck yesterday. All of the students were to have their luggage at school before the morning bell and Mr. Lee used the “Trust, but Verify” method. He had all 130 some kids line up their luggage, introduced the town police and drug sniffing dog to the students and invited the students to wait in another location while the dog verified the luggage was clean. It was, but I thought it was a nice touch, just to reinforce the expectations set before the trip concerning behavior and representing their school, town, and state in a positive manner! 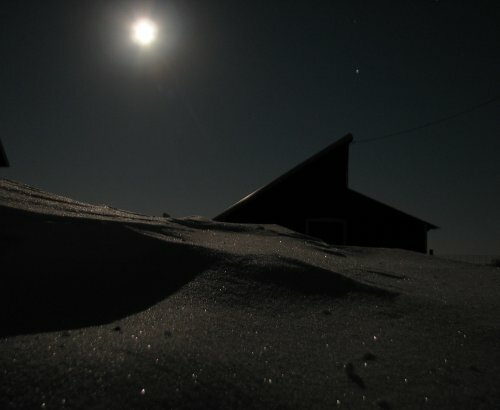 Just because it’s cold and dark, doesn’t mean that chores can slack. 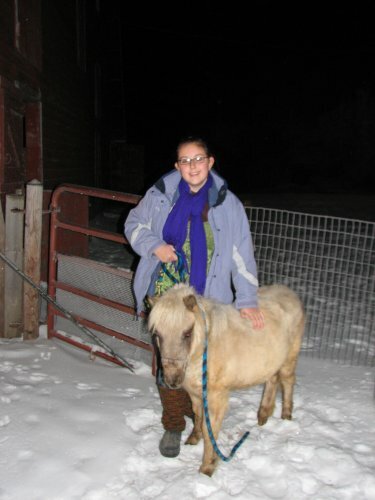 Winter outdoor chores are greatly reduced – the horse, a couple of goats, laying hens and pets. Everybody needs water and food for the day and eggs need to be gathered. We’re on a seasonal rotation, with duties changing with the turn of each season – so starting in a few days, the chores will rotate once again.